A. E. Dessler and E. A. Parson, 2010. The Science and Politics of Climate Change: a Guide to the Debate, 2nd edition. Cambridge, UK: Cambridge University Press. The second edition of Dessler and Parson's acclaimed book provides an integrated treatment of the science, technology, economics, policy, and politics of climate change. 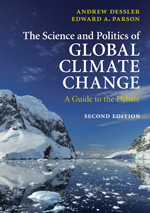 Aimed at the educated non-specialist, and at courses in environmental policy or climate change, the book clearly lays out the scientific foundations of climate change, the issues in current policy debates, and the interactions between science and politics that make the climate change debate so contentious and confusing. This new edition is brought completely up to date to reflect the rapid movement of events related to climate change. In addition, all sections have been improved, in particular a more thorough primer on the basic science of climate change is included. The book also now integrates the discussion of contrarian claims with the discussion of current scientific knowledge; extends the discussion of cost and benefit estimates; and provides an improved glossary. E. A. Parson, V. Burkett, K. Fisher-Vanden, D. Keith, L. Mearns, H. Pitcher, C. Rosenzweig, M. Webster, Global-Change Scenarios: Their Development and Use. Synthesis and Assessment Product 2.1b, US Climate Change Science Program, 2007. E.A. Parson, editor, Governing the Environment: Persistent Challenges, Uncertain Innovations, Toronto: University of Toronto Press. 2001. (Also published as Gérer l’environnement, les Presses de l’Université de Montréal, 2001). National Assessment Synthesis Team (collective author), Climate Change Impacts on the United States: (two volumes: "Foundation" and "Overview"). US Global Change Research Program. New York: Cambridge University Press, 2001. Social Learning Group (collective author), Learning to Manage Global Environmental Risks: a Comparative History of Social Responses to Climate Change, Ozone Depletion, and Acid Rain, Vol. 1. (W.C.Clark et al, eds. ), Cambridge: MIT Press. 2001. Social Learning Group (collective author), Learning to Manage Global Environmental Risks: a Comparative History of Social Responses to Climate Change, Ozone Depletion, and Acid Rain, Vol. 2. (W.C.Clark et al, eds. ), Cambridge: MIT Press. 2001. E.A. Parson, "Ontario Electricity Policy: the climate challenge", Ch 2 in Current Affairs: Perspectives on Electricity Policy for Ontario, D. Reeve, D. DeWees, and B. Karney, eds., University of Toronto Press. 2010. Order book from University of Toronto Press. E.A. Parson, "Environmental Trends: a Challenge to Canadian Governance", Chapter 1, pp. 3-29, in E.A.Parson, ed., Governing the Environment: Persistent Challenges, Uncertain Innovations, Toronto: University of Toronto Press. 2001. E.A. Parson, "Persistent Challenges, Uncertain Innovations: a Synthesis", Chapter 9, pp. 345-380, in E.A. Parson, ed., Governing the Environment: Persistent Challenges, Uncertain Innovations,Toronto: University of Toronto Press. 2001. Articles in Policy and Popular Journals, Book Reviews, etc. E.A. Parson, Review of Restoration of the Great Lakes: Promises, Practices, Performances, by M. Sproule-Jones. Canadian J. Pol. Sci. 37, no. 2 (2004): 439-41. E.A. Parson, "Moving Beyond the Kyoto Impasse", New York Times Opinion, pg. A23, July 31, 2001. D.W. Keith and E.A. Parson, "A Breakthrough in Climate-Change Policy?" Scientific American, February 2000, p. 78-79. E.A. Parson and O. Greene, "International Ozone Agreements: Response to comments by Ian Rowlands." Environment 37:3, p. 3, April 1995. E.A. Parson and O. Greene, "The Complex Chemistry of the International Ozone Agreements". Environment 37:2, p. 16 March 1995. P. Haas, M. Levy, and E.A. Parson, "Appraising the Earth Summit", Environment 34:8, October 1992. E.A. Parson, P. Haas, and M. Levy, "A Summary of the Major Documents signed at the Earth Summit and Global Forum", Environment 34:8, October 1992. A.R. Dobell and E.A. Parson, "A World Atmosphere Fund", Policy Options, Nov. 1988. Making Global Scientific Assessments More Useful for Policy. Arthur M. Sackler Colloquium on Linking Knowledge with Action for Sustainable Development. National Academy of Sciences, Washington DC, April 3 – 4, 2008. Carbon Taxes and Cap-and-Trade Systems: Design Issues and Political Risks. First meeting of the global policy advisory network, OECD, Paris, Mar 31 – Apr 1, 2008. The Science and Politics of Global Climate Change. Public lecture, School of Environmental Studies, University of Waterloo, March 19, 2008. Strategic Behavior and Technological Innovation in Environmental Regulation. School of Public Policy and Governance and Law School, University of Toronto, Mar 18, 2008. Promoting Innovation through Environmental Regulation. External Advisory Board, Erb Institute for Global Sustainable Enterprise, February 15, 2008. Strategic Behavior and Technological Innovation in Environmental Regulation. Humphrey Institute of Public Affairs, University of Minnesota, December 17, 2007. Climate Change and Energy Security: Synergies and Tradeoffs. Conference on International Governance Innovation, Waterloo Ontario, October 27, 2007. Breaking the energy climate change deadlock. Workshop on Summit Reform and Climate Change, Toronto, October 25, 2007. Breaking the deadlock on climate mitigation policy, public lecture, University of British Columbia Faculty of Law, April 3, 2007. Rethinking Climate Change Policy. Science, Technology, and Public Policy lecture series, University of Michigan, March 26, 2007. Useful Global Change Scenarios: current issues and key challenges. Workshop on Interrogating the Practice and Politics of Scenarios, Watson Institute of International Affairs, Brown University, Providence Rhode Island, March 23-24 2007. Climate Change: Treatment of Uncertainty in Assessments and Decision-Making. (Panel organizer and presenter), American Association for the Advancement of Science (AAAS) Annual Meeting, San Francisco, February 19, 2007. Breaking Global Deadlocks, preparatory meeting for L-14 leaders initiative, Cambridge Ontario, January 28-30, 2007. A New Perspective on Technology-Forcing Regulation. University of Michigan Energy Institute symposium, January 18, 2007. Strategic Behavior and Technological Innovation in Environmental Regulation. Victoria Colloquium on Legal, Political, and Social Theory, October 6, 2006. Developing Sustainable Energy Policy: Building Paths to a Low Carbon Society, Lawrence Centre for Policy and Management, University of Western Ontario, October 22-24, 2006. The Kyoto Deadlock and Potential Resolutions. Institute for Sustainable Energy, Environment, and Economy, University of Calgary, November 10, 2005. Scenarios in Global-Change Analysis and Decision-Making. Workshop on Critical Issues in Climate Change, Stanford Energy Modeling Forum, Snowmass CO, July 28-29, 2005. The International Climate-Change Deadlock: An Assessment of Proposed Resolutions. Michigan Legal Theory Workshop, April 18, 2005. American Exceptionalism in International Environmental Policy. Annual meeting, American Society of International Law, Washington DC, April 1, 2005. Scientific Integrity in Policy-Making: The Case of Climate Change. Symposium on Scientific Integrity, Union of Concerned Scientists, Ann Arbor, March 21, 2005. The Science and Politics of Global Climate Change. Michigan Environmental Law Association Annual Symposium, March 16, 2005. Technological Transitions and Industrial Transformations: Assessment and Prospects. Symposium on Industrial Transformation, Free University, Amsterdam, March 10, 2005. Technical Uncertainty and Strategic Behavior in Environment, Health, and Safety Regulation. Michigan Fawley Seminar, February 9, 2005. Climate Change and Human Health: Assessing Impacts and Responses. Third Isadore Bernstein Symposium, School of Public Health, University of Michigan, March 26, 2004. Can Scientific Claims Influence Policy Outcomes? Michigan Fawley Lunch, Oct 29, 2003. Scientific Knowledge, Controversy, and Assessment in Global Change Regimes; Policy-Technology Interactions in Environmental Management (convened two sessions). Int'l meeting on Human Dimensions of Global Change, Montreal, Oct 16-18 2003. Impacts of Global Change: Assessment Challenges and Political Challenges. Faculty research seminar, SNRE, University of Michigan, Oct 10, 2003. Assessing Climate-Change Impacts and Adaptation Potential, Tyndall Center for Climate Change Research, Somerset House, London, June 16, 2003. Carbon Capture and Sequestration for Greenhouse-gas Mitigation: Prospects, Promise, and Pitfalls. Union of Concerned Scientists, Cambridge MA, April 4, 2003. Strategic Planning Workshop, US Climate Change Science Initiative, Dec 3-5, 2002. Brainstorm 2002: the Fortune Editors' Invitational Conference, Aspen, July 29-31, 2002. Uncertainty and Decision Making in Climate Change. Workshop on Climate Scenarios and Uncertainty, National Center for Atmospheric Research, Jul 17-19, 2002, Boulder CO.
Adaptive Management: Can it work? What would it take? Environment Canada Policy Research Lecture Series, June 22, 2001. Governing the Environment: Key Challenges, Proposed Responses. Keynote speech, Deputy Ministers' lunch, Government of Canada, October 2000. The Origins, Evolution, and Uses of Policy-Relevant Uncertainties: Insights from 25 Years of Ozone-Layer Debates. American Association for the Advancement of Science (AAAS) Annual Meeting, Washington DC, February 20, 2000. Integrated Assessment: Social and Political Dimensions, Keynote address, International meeting on Human Dimensions of Global Change, June 12-14 1997, Vienna, Austria. Integrated Environmental Assessment: Goals, Methods, Challenges, Keynote address, Conference on Assessing Atmospheric Change, Mar 27-28, 1995. Toronto, Canada. Searching for Integrated Assessment: Methods and Projects in the Integrated Assessment of Climate Change, 3rd meeting, Commission on Global Environmental Change Information Policy, NASA, Washington DC, February 17, 1994. Climate Change Negotiation, The Salzburg Seminar, June 1990 and May 1991. E. A. Parson, "The International Policy Environment for Carbon Capture and Sequestration," Report to National Energy Technology Laboratory, U.S. Department of Energy, April 2003. R.B. Mitchell and E.A. Parson, "Implementing Joint Implementation: Developing a Management and Performance System for the Kyoto Protocol’s 'Clean Development Mechanism'". Environment and Natural Resources Program Discussion Paper E-98-06. Harvard University. June, 1998. E.A. Parson, S. Agrawala, A. Patt, R. Keohane, R. Mitchell, L. Botcheva, W. Clark, E. DeSombre, J. McCarthy, E. Shea. "Explaining the Form of Assessments: Why do we get the assessments we do?" Environment and Natural Resources Program Discussion Paper E-97-12. Harvard University. 1997. W.C. Clark, E.A. Parson, N. Dickson. "Global Environmental Assessment". Environment and Natural Resources Program Discussion Paper E-97-15. Harvard University. 1997. E.A. Parson and K.Fisher-Vanden. "Joint Implementation and its Alternatives: choosing systems to distribute global emissions abatement and finance." Environment and Natural Resources Program Discussion Paper E-97-03. 1997. E.A. Parson, "A Global Climate Change Policy Exercise: Results of a Test Run, July 27-29 1995" Working Paper WP-96-90, International Institute for Applied Systems Analysis, Austria. August 1996. E.A. Parson and K.Fisher-Vanden, "Thematic Guide to Integrated Assessment Models of Global Climate Change", Socio-economic Data and Analysis Center, NASA Mission to Planet Earth, 1996. E.A. Parson, Climate Treaties and Models, Background Study, Office of Technology Assessment, US Congress, Washington DC, June 1994. E.A. Parson, Negotiating Climate Cooperation: Learning from Theory, Simulations, and History. Doctoral dissertation in Public Policy, Harvard University, May 1992. E.A.Parson, "Midwest-Northeast Transmission: A Partial Solution to Acid Rain?" Discussion Paper E-88-05, Energy and Environment Policy Center, Harvard University.